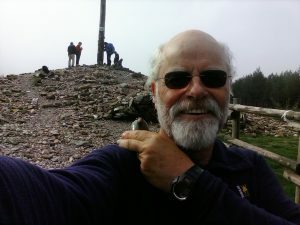 Joe Green at the Cruz Ferro where pilgrims leave a rock from home. The Camino de Santiago, also known as the Way of St James, or Route of Santiago de Compostela, and the Road to Santiago, is the name of the pilgrimage routes or ‘ways’ to the shrine of the apostle St James the Great in the Cathedral of Santiago de Compostela in Galicia, northwestern Spain. According to tradition St James’ remains are buried there. Many take this route as a path or retreat for spiritual growth. On 18 October 2015 I began my Camino, stepping out at St Jean Pied de Port on the beginning of the 780 km walk to Santiago de Compostela, and 29 days later on 15 November I arrived at Santiago. As I walked I reflected on being a pilgrim. These reflections are my lessons from the Way. Is always moving, or is always ready to move. Pope Francis said, ‘Our life is a journey, and when we stop moving, things go wrong’. Is going somewhere, does not wander aimlessly. Is never alone, the prayers and thoughts of loved ones are with them. The pilgrim thinks often of them, and is appreciative. Reflects deeply, on all aspects of life. Does not necessarily know the Way. Where the Way goes, it goes! Comes in all shapes and sizes, nationalities, ethnicities, religions, or none. They all have seemingly different, yet strikingly similar motivations. Savours moments, relationships, contacts, then let’s them go. Is a journeyspite weather, pain, tedium, blisters, chaffing, and things out of the pilgrim’s control. Can happen without leaving home. Can be painful, lonely, fun filled, social, spiritual and all of those at once (just like life). Continues despite weather, pain, tedium, blisters, chaffing, and things out of the pilgrim’s control. The people one meets on the Camino are the real blessing. If someone asks 10 minutes from you, give them 20, they probably need it. You bless them with your time as they bless you. Every pilgrim is on their own journey. When it ends, they have completed their pilgrimage. These thoughts come out of my pilgrimage experience that is deeply personal, and difficult to explain – of having tendonitis, with every painful downhill step of a 600-metre descent; or a prayer for my daughter who had a heart operation that day. I cannot put in words the feeling of having someone go down on their knees at a hostel prepared to dress my blistered left foot – I got a glimpse of how St Peter felt! Or the young woman’s heartfelt request, ‘Do you have time to spend with me?’ She was distraught because she had taken the bus due to sore feet and just wanted to talk about it. Of receiving a photo of my granddaughter tracking my Camino as I checked Facebook each day; or the joy of singing Ka Waiata and He Honore to a Spanish dawn with only the cows and the crows to hear!